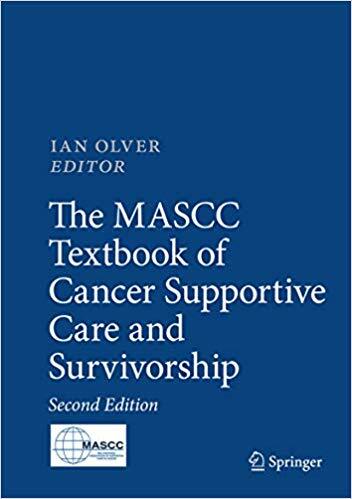 We are pleased to announce that the Second Edition of The MASCC Textbook of Cancer Supportive Care and Survivorship has been published by Springer International Publishing AG. Edited by Ian Olver, University of South Australia, Adelaide, SA, Australia, this edition updates the original Textbook published in 2010. The MASCC Textbook is intended for intended for medical students, residents, and fellows, as well as medical oncologists, radiation oncologists, surgeons, general practitioners, nurses and allied health workers. It is designed to improve management of the symptoms and side effects of cancer and its treatments, resulting in enhanced quality of life for cancer patients and survivors. The new edition of the MASCC Textbook has been completely revised since its first edition in 2010 — a testimony to the changes and new challenges in supportive care over the past eight years. Research and clinical advances have resulted in better understanding of the needs of cancer patients, survivors, and caregivers, as well as increased knowledge about disparities in supportive care and the effects of the financial burdens incurred. Among the challenges are new side effects associated with the advent of targeted therapies. This second edition contains new topics, such as sleep and cancer, anemia, financial toxicity, complementary medicine, survivorship issues, and disparities in care due to geographic, cultural, and socioeconomic factors. All of the chapters have been revised and updated to contain the most current, research-based information. The volume also features case vignettes, key points, and sidebar summaries for quick reference. The MD Anderson Supportive and Palliative Care Handbook. Edited by Eduardo Bruera and Shalini Dalal. Fifth Edition. 2015. MD Anderson Cancer Center. The fifth edition of the Handbook was conceived as a practical bedside tool to assist clinicians in the daily care of patients. This new edition reflects recently acquired knowledge on the assessment of major physical and psychosocial symptoms, as well as new pharmacological and nonpharmacological interventions for supportive and palliative care adopted by the Center’s Department of Palliative, Rehabilitation and Integrative Medicine. Eduardo Bruera, MD, is Professor and Chair of Palliative, Rehabilitation and Integrative Medicine, and Director of the Supportive Care Center, at the University of Texas MD Anderson Cancer Center in Houston, Texas. Shalini Dalal, MD, is Associate Professor of Palliative Care and Rehabilitation Medicine at the MD Anderson Cancer Center. Cancer-Related Fatigue. By Joachim Weis and Markus Horneber. 2015 Edition. Springer Healthcare. Cancer-related fatigue is widely recognized as a significant problem for patients with all types and stages of cancer, as well as those whose cancer is in remission. Some studies show that cancer-related fatigue causes more distress than pain, nausea, or vomiting. Yet, fatigue is often undertreated and understudied. Weis and Horneber’s Cancer-Related Fatigue provides a concise overview of this condition, with an evidence-based discussion of diagnosis, treatment, and long-term management. The authors consider both pharmacological treatments and nonpharmacological approaches, such as psychosocial, and mind-body interventions and exercise therapy. Joachim Weis, PhD, is an Associate Professor in the Department of Psycho-Oncology, Tumor Biology Centre, University of Freiburg, Germany. MASCC member Markus Horneber, Dr. Med., practices in the Department of Oncology/Hematology, Paracelsus Medical University, Klimikum, Nuernberg, Germany. Oxford American Handbook of Hospice and Palliative Medicine and Supportive Care (Oxford American Handbooks in Medicine) 2nd Edition. Edited by Sriram Yennurajalingam and Eduardo Bruera. Oxford University Press. April, 2016. The Oxford American Handbook of Hospice and Palliative Medicine and Supportive Care is an easy-to-use resource for the day-to-day management of patients who need palliative and hospice care. The Table of Contents follows the core curriculum of the American Board of Hospice and Palliative Medicine and the information is designed to meet the educational and clinical information needs of students, residents, fellows, and nurse practitioners. The 2016 edition has been updated to incorporate the National Consensus Project for Quality Palliative Care Clinical Practice Guidelines. It also contains new sections on grief and bereavement, medical marijuana, and physician assisted suicide. Sriram Yennurajalingam, MD, is Assistant Professor of Palliative Care & Rehabilitation Medicine at the University of Texas MD Anderson Cancer Center in Houston, Texas. Eduardo Bruera, MD, is Professor and Chair of Palliative, Rehabilitation and Integrative Medicine, and Director of the Supportive Care Center, at the University of Texas MD Anderson Cancer Center in Houston, Texas. Textbook of Palliative Medicine and Supportive Care. Edited by Eduardo Bruera, Irene Higginson, Charles F. von Gunten, and Tatsuya Morita. CRC Press. April, 2016. The second edition of the Textbook of Palliative Medicine and Supportive Care, published in 2014, builds on the strengths of the previous edition, providing essential guidance for healthcare providers in palliative medicine. The new edition includes chapters on several different aspects of supportive care from an international team of editors and contributing authors. It features new sections on the adverse effects of medical treatments and on rehabilitation and survivorship. This edition also contains new information on chemotherapy- and radiation therapy-induced emesis, geriatric palliative care, and hormonal therapy and targeted agents. The paperback release is scheduled for April, 2016. MASCC member Eduardo Bruera, MD, is Professor and Chair of Palliative, Rehabilitation and Integrative Medicine, and Director of the Supportive Care Center, at the University of Texas MD Anderson Cancer Center in Houston, Texas. Irene J. Higginson, PhD, FRCP, is Professor and Head of the Department of Palliative Care, Policy and Rehabilitation, King's College London, UK. Charles F. von Gunten, MD, PhD, is Director, Center for Palliative Studies, San Diego Hospice and Palliative Care, San Diego, California, USA. Tatsuya Morita, MD, practices in the Department of Palliative and Supportive Care, Seirei Hospice and Seirei Mikatahara General Hospital, Hamamatsu, Shizuoka, Japan. Springer Healthcare - MASCC members receive a 30% discount on all Springer titles. >>view access code (login required). Supportive Care Strategies. L. Finn, A. R. Roche Green (Eds. ), 2019. The MASCC Textbook of Cancer Supportive Care and Survivorship. I. Olver (Ed), 2018. Psycho-Oncology (Recent Results in Cancer Research). Second Edition. U. Goerling (Ed), A. Mehmert (Ed), 2018. Acute Side Effects of Radiation Therapy: A Guide to Management. A. Sourati, A. Ameri, and M. Malekzadeh. 2017. Supportive Cancer Care. D. Alberts, M. Lluria-Prevatt, S. Kha, K. Weihs (Eds. ), 2016. Supportive Care in Pediatric Oncology: A Practical Evidence-Based Approach. J. H. Feusner (Ed), C. A. Hastings (Ed), A. K. Agrawal (Ed), 2015. Cancer-Related Fatigue. J. Weis and M. Horneber, 2015. Febrile Neutropenia. J. A. Klastersky (Ed), 2014. Prevention of Nausea and Vomiting in Cancer Patients. M. Aapro, K. Jordan, P. Feyer, 2013. Managing Cancer Breakthrough Pain. D. R. Taylor, 2013. Cancer-Related Fatigue. J. Weis and M. Horneber, 2013. Evidence-based Non-pharmacological Therapies for Palliative Cancer Care. W. C.-S. Cho (Ed. ), 2013. Pathobiology of Cancer Regimen-Related Toxicities. S. T. Sonis and D. M. Keefe (Eds. ), 2013. Oral Mucositis. S. T. Sonis, 2013. New Challenges in Communication with Cancer Patients. A. Surbone, M. Zwitter, M. Rajer, R. Stiefel (Eds. ), 2013. Cancer Cachexia. E, Del Fabbro, A. Inui, F. Strasser, D. Blum, H. Suzuki, 2012. Cancer Caregiving in the United States: Research, Practice, Policy. R. C. Talley, R. McCorkle, W. F. Baile (Eds. ), 2012. The MASCC Textbook of Cancer Supportive Care and Survivorship. I. Olver, 2011. Supportive Care in Cancer Patients. H.-J. Senn, A. Glaus, and L. Schmid (Eds. ), 2011. Physical Activity and Cancer. K. S. Courmeya and C. M. Friedenreich, 2011. Supportive Cancer Care with Chinese Medicine. W. C.-S. Cho, 2010. Exercise and Cancer Survivorship: Impact on Health Outcomes and Quality of Life. J. and A. Daley, 2010. A Healthcare Provider’s Guide to Cancer and Obesity. A. Katz, 2017. Integrating Physical Activity into Cancer Care: An Evidence-Based Approach. L. M. Bernardo, B. J. Becker, 2017. Standards of Oncology Education: Patient/Significant Other and Public (Fourth Edition). C. S. Blecher, A. M. Ireland, J. O. Watson, 2016. Ethics in Oncology Nursing. J. M. Erickson (Ed), K. Payne (Ed), 2016. A Guide to Oncology Symptom Management (Second Edition). C. G. Brown (Ed. ), 2015. Nurturance for Nurses: Reflections for Compassionate Healers. D. A. Boyle, 2012. Understanding and Managing Oncologic Emergencies: A Resource for Nurses. M. Kaplan (Ed.). 2nd Edition, 2012. Managing the Oral Effects of Cancer Treatment: Diagnosis to Survivorship. M. L. Haas and D. L. McBride (Eds. ), 2011. Cancer Rehabilitation and Survivorship: Transdisciplinary Approaches to Personalized Care. J. L. Lester and P. Schmitt (Eds. ), 2011. Psychosocial Dimensions of Oncology Nursing Care. 2nd Edition. C. C. Burke (Ed. ), 2009. The MD Anderson Supportive and Palliative Care Handbook. Fifth Edition. Bruera D and Dalal S (Eds.). University of Texas Health Science Center, Houston, Texas, 2015. Dr. Lacouture’s Skin Care Guide for People Living with Cancer. M. E. Lacouture. Harborside Press, 2012. Dermatologic Principles and Practice in Oncology: Conditions of the Skin, Hair, and Nails in Cancer Patients. M. E. Lacouture. Wiley-Blackwell, 2014. Principles and Practice of Palliative Care and Supportive Oncology. Fourth Edition. A. M. Berger, J. L. Shuster, J. H. Von Roenn (Eds.). Lippincott Williams & Wilkins, 2013. Supportive Oncology. M. P. Davis, P. Feyer, P. Ortner, C. Zimmermann. Saunders, 2011. Nursing Care of Children and Adolescents with Cancer and Blood Disorders. 4th Edition. Association of Pediatric Hematology/Oncology Nurses, C. Baggott, D. Fochtman, G. Foley, K. P. Kelly (Eds.) APHON, 2011. Handbook of Psychotherapy in Cancer Care. 1st Edition. M. Watson and D. W. Kissane (Eds). Wiley, 2011. Gynecologic Oncology: Evidence-Based Perioperative and Supportive Care. 2nd Edition. S. A. Vasilev, S. E. Lentz, A. E. Axtell. Wiley-Blackwell, 2011.